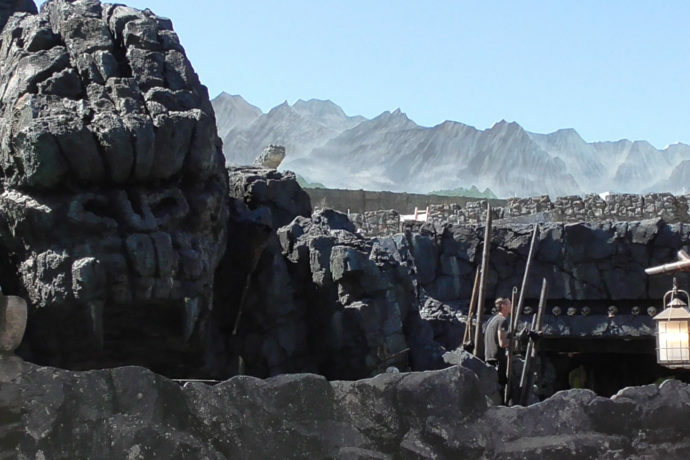 The non-stop construction continues for the new multi-sensory ride, Skull Island: Reign of Kong, opening soon at Islands of Adventure. Today I got my first glimpse of vehicle testing and got a chance to see what else is being worked on at the site. The food stand, named “The Mess Tent”, is nearly ready to start serving guests. It already has all the equipment and warmers it needs to offer snacks like soft pretzels, churros, and cold drinks. And now they’re decorating it with nets, ropes, and other decor to better match the area. New exterior lighting has appeared, mainly pointing at the temple gates and surrounding area. Much of the lighting has a blue tint to create the perfect nighttime mood after dark. I also saw folks painting and set-dressing the area near the entrance, adding accents to bamboo spears and painting. Check out the video and snapshots below and stay tuned for more updates! Vehicle tracking devices seen on roof. Bumpy road surface below vehicle. Pretzels, churros, and a glass case… perhaps for brookies? Or maybe Kong themed… banana cakes? What looks to be a surveillance camera lodged in a rock. Can you spot it? That’s all for this Kong update! That’s all for this Kongstruction update. Check out the last Kong update with new Kong merchandise and fire effects testing here. See all the Kong updates and subscribe to the feed for more continual updates! And please subscribe to my YouTube channel for more theme park videos and construction updates!